Wow, we have some rocking weather here in El Paso. We’ll be in high 60’s and into the 70’s all week. Wasting no time I ran right outside to bring you a review I have been waiting to get to, Jaime Garcia’s Reserva Especial Limited Edition 2011 Shade. The Good Stuff: I reviewed the broadleaf less-exclusive version of the cigar here and we actually named it as our cigar of the year for 2011. This is the more exclusive version of the already incredibly exclusive cigar. Each of the 3,700 boxes came with 16 cigars, one of those 16 cigars is this shade wrapped blend. It’s basically the exact same blend only with a tweaked Ecuadorian Connecticut Shade wrapper. The Jaime Garcia Reserva Especial Limited Edition 2011 is very similar in blend to the standard Reserva Especial only with a higher priming. After the wrapper Jaime decided to showcase some of his choice Pelo De Oro leaf as well as two different types of Cuban Seed. These cigars were showcased at this year’s IPCPR convention, and started to hit shops in August. These cigars are probably sold out by now, but if you are lucky enough to stumble across them they will run you about $16 a cigar. 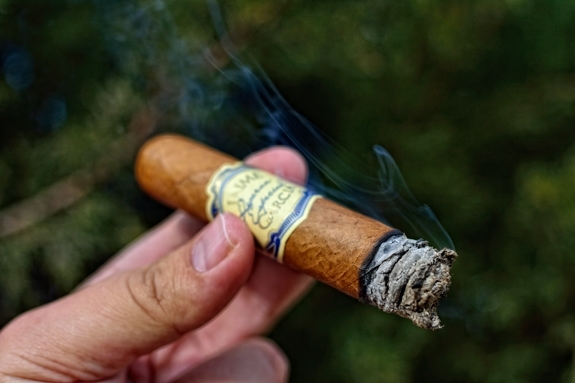 Check out this review of the broadleaf version so that you can see just how absolutely beautiful the box these cigars come in are. I won’t go into details. Prelight: The first thing I noticed about the Jaime Garcia Reserva Especial Limited Edition Shade was that this cigar weighed a ton. The Standard Limited Edition was heavy as well, but in comparison to those that I have and this shade one, the shade was so much heavier. I’m sure this wasn’t done on purpose as this is supposed to be the same blend, only with a different wrapper. Anyways. The Ecuadorian Connecticut Shade wrapper on this bad boy is a beautiful one. The wrapper is a very light, yellowish brown and like most shade wrappers, is incredibly consistent in color, smooth, and vein free. 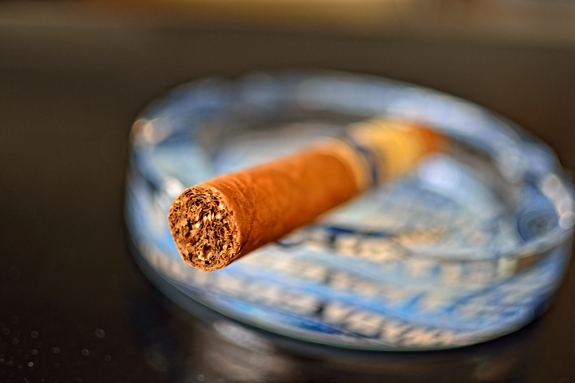 The body of the cigar is silky smooth, heavy, and firm while the delicate wrapper leads up to the round triple cap. The double band on this cigar matches the LTD Reserva Especial with the broadleaf wrapper identically. Unlike the broadleaf, this wrapper is a lot more modest with its aroma only teasing with a subtle cedar and spice. The foot however expels a ton of spice, pepper, and tobacco. The sharp pepper actually irritated my nose a bit as I went in for a huge whiff. The cap was REALLY tough and took a little convincing from my double bladed Palio cutter. 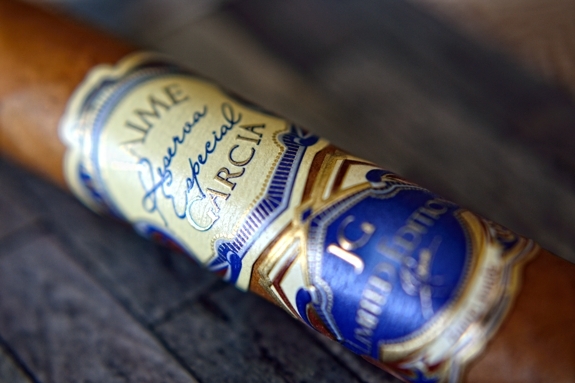 Once cut, the Jaime Garcia Reserva Especial Limited Edition Shade let loose this crazy lacquer, paint flavor. I picked it up in the Broadleaf version too, but not as strong as I could in this one. It has to be from the filler tobacco. Anyways, outside of that I got a little salt off the wrapper, and some spicy earth and cedar tones from the filler. First Smoke: Right away I am greeting with a ton of pepper on my lips and tongue followed by some really strong spice and cinnamon, some soft tobacco and cedar, and a little underlying sweetness and honey. Just like the broadleaf version, that paint I picked up in the cold draw wasn’t in the actual experience at all. The draw on this thing is crazy. 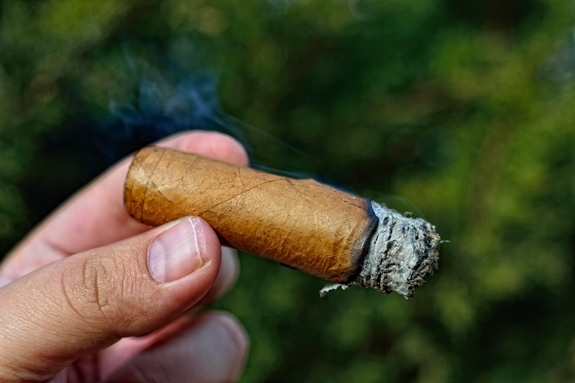 I find myself only puffing the cigar once and getting plenty of thick white smoke. The burnline is pretty even with only some very subtle waves, and razor sharp. This cigar kicks out tons of smoke on the draw but almost nothing at all as it sits in my ashtray. The ash is a really nice white and light grey which held on for a little over an inch before giving way into my lap, again. So this picture is of the second ash. I really need to stop being lazy and get up more often to take these pictures before the ash falls. Halfway There: Holy Cedar Explosion Batman! Seriously. The Broadleaf version was sweet while the Shade version of this Jaime Garcia Reserva Especial explodes in the second third with some crazy thick cedar and honey flavors. It tastes like I am smoking a graham cracker. There is still a ton of spice and a little pepper, but the cedar, cinnamon and honey have completely taken over. The retrohale is just awesome coating with this strong cedar with a hell of a lot of spice. I usually don’t feel much of a nicotine kick from shade wrapped cigars due to their mildness, but I swear I’m already feeling a little something from this one. The burnline is still a bit wavy but I haven’t had to touch it up or relight so I’m ok with that. Another note is that the ash fell into my lap yet again. This ash my look strong, but be careful, It’s not! Now let’s see if I can manage to get any ash in my ashtray at all. Finish: It’s always nice when band on cigars come off with ease, and in the case of both massive bands on this Jaime Garcia Reserva Especial Limited Edition Shade that was the case. This cigar has started out flavor packed and although the body has really ramped up into the final third of the cigar (plus I have a nice buzz from this beer), the cigar has remained true producing a very smooth experience. The main flavor is still that cedar but the honey and spice has really toned down leading the way for the earth and tobacco flavors to really shine though. I am feeling a mean nicotine kick at this point. 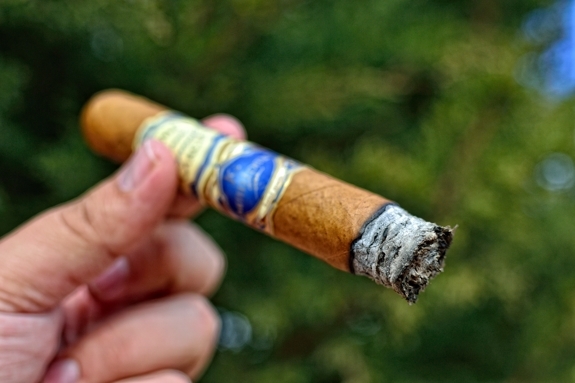 All in all it took slightly less then two hours to smoke this cigar down to the nub and I experienced absolutely no harshness into the final inch. The cigar required no touch ups to relights at all. 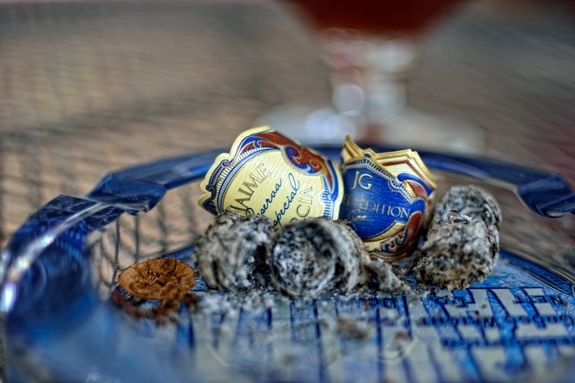 Overview: Although the Jaime Garcia Reserva Especial Limited Edition 2011 Shade is a good cigar, in my opinion it doesn’t hold a candle to the broadleaf counterpart. You need to keep in mind that this cigar was originally blended for the broadleaf wrapper, not the shade and because of that, it isn’t nearly as balanced. The body is way to high for the wrapper and at times the filler and binder overpowered the hell out of the wrapper. It’s a good cigar and a nice departure and a nice touch for an already limited edition blend, but I am glad the box only came with one of these. If you are a fan of the Reserva Especial blend then by all means, check this cigar out, it’s fun. It’s neat to see just how much of each cigar smoking experience weighs in the wrapper. But if you are looking for a nice, full flavored Connecticut I think you are way better off saving your money and looking at something like Oliva’s Connecticut reserve or EP Carrillo’s New wave Connecticut. Pairing: Pairing with another wonderful Belgian winter seasonal, this Jaime Garcia Reserva Especial Limited Edition Shade went down with some Scaldis Noel Premium (Also known as Bush de Noel). 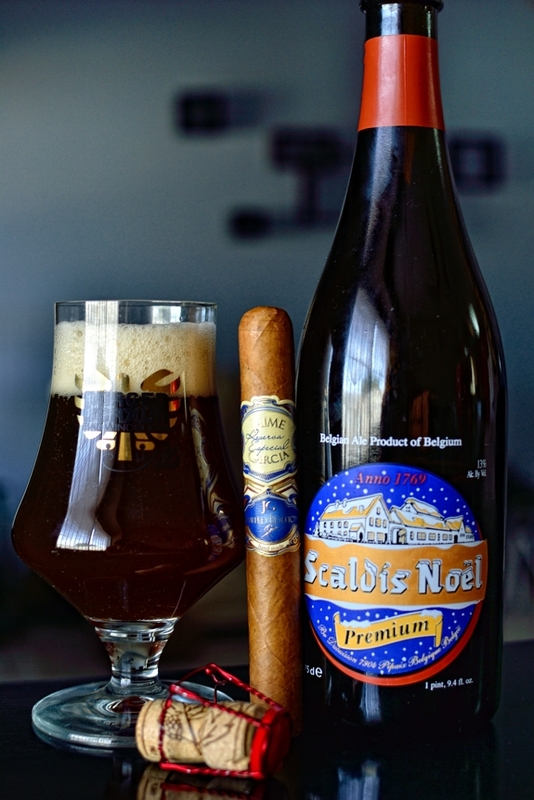 The only difference between the Scaldis Noel and the Premium is the ABV as the Premium sits at 13% while the standard Scaldis Noel sits comfortably at 12.5%. Both pack a hell of a punch. The extra .5% actually comes about as the beer is literally refermented in the bottle it comes in. This brilliant red Belgian strong ale is brewed at Brasserie Dubuisson Frères sprl in Belgium. The beer has a very fruity and sweet complex as it masks the strong alcohol complex. Smooth and rich this beer paired perfectly with the strength and body of the Jaime Garcia Limited Edition Shade without overpowering it. They actually went along perfectly hand in hand taking turns complimenting each other. This beer probably wouldn’t go well with any other shade cigar, but would pair perfectly with a nice Habano. We have some rocking weather here too…except in the opposite direction…temps and windchills in the minus double digits Celsius this past weekend (as Daniel can attest). This is another cigar on my “to try” list…although I am not a fan of a consistent sweet cedar taste…experienced it recently with an Ashton Cabinet Selection…got tired of that flavour pretty quickly…unfortunately it seemed to last most of the stick…sounds like you at least had some spice to break things up a bit. Hopefully things warm up here a bit…making cigar smoking very difficult. Ugh, Daniel was telling me about that. I couldn’t handle that. I’d be a popsicle in a week! Hopefully you guys pull out of it soon and get some nice weather to enjoy some great smokes. The cedar in no way was over powering. It was really good actually, but I am one that does actually like the consistent cedar flavors. 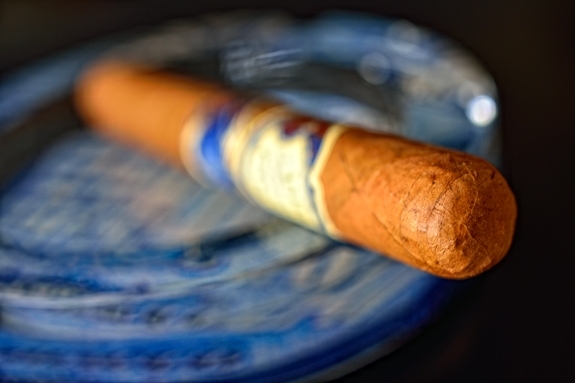 The Camacho Liberty 2009 comes to mind when I think of crazy cedar cigars. It looks like things might warm up here for a bit…but at this time of year we are never that far from another cold snap. I like cedar…I think it was that continued sweet taste that was turning me off. I haven’t had a Camacho before, my buddy picked one up for me when he was in DC a coupe of months ago…it is sitting in his humi for my next visit…I think it is the Connecticut…now if we can just get the mercury headed in the right direction! Tony is a warm weather wuss, he definitely wouldn’t last through the weather we had last week! Tonight is promising to be warmed so I’m definitely gonna grab a cigar out of the humi. Eh, you guys got to lay off Tony. Isn’t he born and raised in Texas??? Sure, everything is bigger in the big T but if you’re not raised up here in the Great White North, with our igloos and having to melt snow for water , how would you ever get used to the cold??? Take it all in stride Tony, another great review. P.S. where is Paul Tyler from? haha thanks for having my back Lou! We have the exact opposite weather here. We go through our summer months way over 100 degrees. Like I said, snow? What’s that?! haha! Nice and honest Tony! I hesitated to pull the trigger on one of these. I am not a huge Jaime Reserva fan. The one I smoked was good, but too many other options in that price range for me. Then these things came out, and I just didn’t bite. All the guys working at the B&M were raving about them (of course they are in it for the $ also) and they have given me a few weak reccomendations before, so I hesitated and not to upset that I did. Stay warm as we have been damn cold here too… Not canadian cold, but cold for the south. 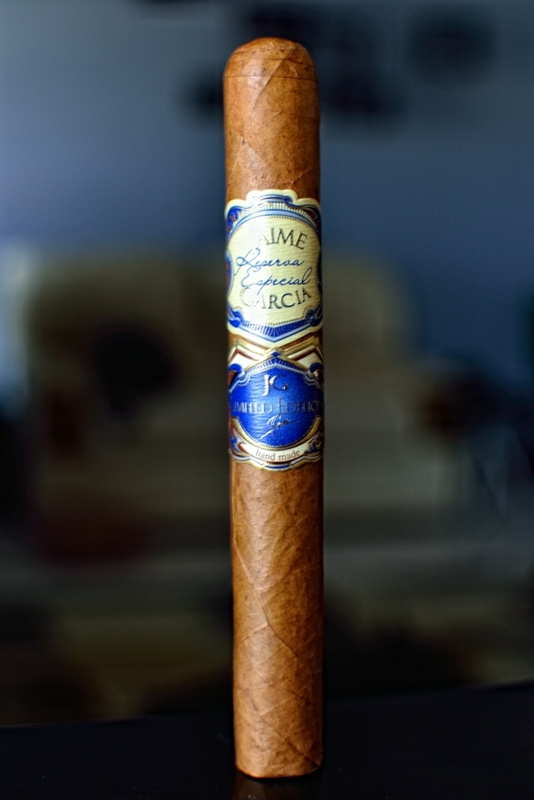 My Jaime Garcia Reserva Especial Limited Edition Shade Weighs a Ton (MJGRELESWAT)? That’s a nice looking stick. Too bad it doesn’t measure up to its price point. That’s a dangerous beer, man. It would be like drinking an entire bottle of wine. HAHA every time I typed that name up I was like “ugghhhh.. again…”. I don’t think I’d spring for anymore of the shade version of this blend but the broadleaf, although pricey, is well worth the coin! The beer is a beast, I walked away buzzed just from this one… gotta love this! Aaaahhh I see… these were not in the boxes on the shelves. I remember the guys saying they had bought them already…. Doh… I guess I will see if I can find these regular limited (your #1) ones Maybe through a trade or something…. I smoked a JG TAA and thought it was ok…..